Looking to provide services or products to the resorts and resorts’ executives? Blue Mail Media can help you out! 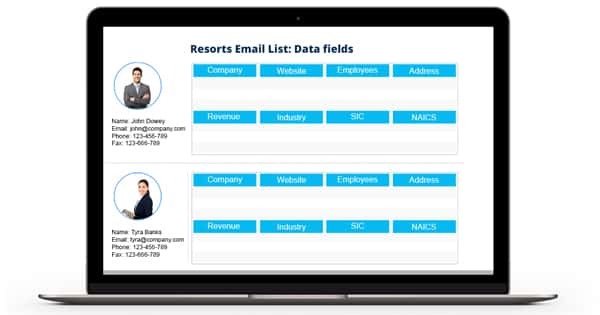 Our Resorts Mailing List is a highly segmented database encompassing contact records of the business professionals and decision-makers of the resorts across the world. All the contacts in this list are accurate and verified using the most cutting-edge marketing technologies. We update this list within every 4-5 months. We also give you the luxury of getting this pre-packaged database customized as per the unique requirements and challenges of your business. Increase the traffic and maximize the conversions! Now, reach the event planners, conference managers, Public Relations Coordinators, directors, and other business executives associated with resorts, hotels, and restaurants with a customized database. We provide Resorts Email Database – a data repository of accurate, verified, and updated contact addresses. If you are a wedding planner, corporate event-planner, caterer, or any business professional dealing in business related to the hospitality industry, this list gives you access to reach the idle audience successfully. Our data scientists have collated this database by using industry-specific sources such as business directories, trade shows, and events and conferences.